The City of Houston continues to respond to the winter weather affecting Houston. Weather is expected to deteriorate over the next few hours and roadways will continue to ice and freeze over. The low temperatures tonight will not do anything to help the situation, and residents should expect conditions to worsen overnight, causing traffic problems. Non-Emergency City Services are suspended on Tuesday, January 16th. For an update on specific department services, visit houstonemergency.org. The Office of Emergency Management has activated the City’s Emergency Operations Center to coordinate the City’s response to this winter weather event. Various agencies are working with the City to ensure a quick, effective response. Houston Public Works has been pre-treating area roadways since early this weekend to prevent ice build-up. It’s important to note that ice is likely still to form on bridges and overpasses. Additionally, HPW crews are being dispatched to spread gravel on area roadways to provide for additional traction. Residents who see ice on City roads can call 3-1-1 (713.837.0311) to report it. The Houston Police Department is responding to calls for service related to accidents being caused by drivers on icy roads. HPD reminds residents to avoid travel and stay off the roads if possible. If you are in an accident, you are asked to stop, take insurance information, and take photos of the accident. If you need to file a police report, you can do so afterward online at houstonpolice.org. The Houston Fire Department has responded to multiple structure fires due to improper heating of homes. Residents are reminded to not use non-traditional ways of heating their homes, such as stoves and ovens. This can not only cause fires, but dangerous carbon monoxide to form. Remember to keep at least 3 feet of space around space heaters. The Houston Parks & Recreation Department has suspended operations at all Community Centers, Golf Courses, Tennis Centers, the Metropolitan Multi-Service Center, the Cullen Memorial park Running Trails Center and the Memorial Park Fitness Center. The Municipal Courts Department has suspended cases and jury duty for the day. Those with court dates today will have the option to reset their cases from Wednesday, January 17th to Tuesday, January 23rd. For more details, click here. 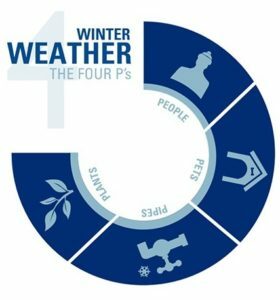 BARC Animal Shelters & Adoptions is closed to the public 1/15/2018 due to the threat of severe winter weather. As always, BARC staff will be reporting to work in the morning to care for their animals. Temperatures are expected to drop near freezing overnight & continue to drop below freezing in the morning & into the afternoon & evening. BARC reminds residents to bring your pets indoors. Remember, if it’s too cold for you, it’s too cold for them. The Solid Waste Management Department has suspended trash pickup for the rest of the day and will resume when conditions are safe. The Houston Airport System is reporting significant delays and hundreds of flight cancellations due to this storm. If you have a flight scheduled, or are expecting someone, you are asked to check with your carrier before heading to the airport. Visit fly2houston.com for updated information on flight conditions. Residents who need transportation to access warming centers can call 3-1-1 (713.837.0311). Because of unsafe conditions, Houston residents are being asked to remain indoors and avoid roadways today. Also, freezing rain and sleet mean that sidewalks, driveways, and other paved surfaces are very dangerous. People: Check on neighbors, the elderly, and those with disabilities to ensure they have what they need to weather the storm. Also, be sure you are dressed properly. The Houston Health Department recommends that people who must be out in the weather dress in warm layers, with a waterproof outer layer. Pets: Bring pets indoors, or provide them with a safe, warm place to be during this storm. Remember, if it’s too cold for you to be outside, it’s too cold for pets. Plants: Protect plants from freezing temperatures by covering them with thick cloth. Hard freeze conditions will likely kill plants overnight. CenterPoint Energy is working with the City of Houston to identify areas that are without power and to secure any power lines that come down as a result of ice. CenterPoint’s smart meters are able to detect power outages, so it is not necessary to contact them if your power goes out. Be sure to sign up for their Power Alert Service so you can be notified of the progress of power restoration. You can also check a map of current outages at centerpointenergy.com. If you see a downed power line, get far away and when safe, call 9-1-1. Visit houstontranstar.org for information on traffic conditions across Houston. Additional updates will be provided by AlertHouston as they become available.